What do you get if you take one Monkey named Dougie, something of an evil overlord/master a whole lot of loot? The answer is a platforming game by the name of Monkey Loot, which is developed by Tackorama. Only the Loot Monkey game that released on Switch and PC, earlier this month is not the original game, for it is a sequel to the 2D, flip-screen 8-bit platformer and the sequel comes with the full title of Loot Monkey: Bling Palace. Although the game’s comes across as being more of an arcade game than your typical platformer, there is a simple story to it and a roguelike nature that will deter potential players. You see, one day, the Overlord whom Dougie serves, throws a party and it must have been something straight out of the Hangover films as the overlords dwelling, is a colossal mess the next day. Not only are there piles of vomit here and there, but there’s even loot that clearly must have been ransacked from a treasury of some sort and then dropped all over the place and even then that’s not the worst of it. Being the loyal subordinate that he is, it is down to Dougie to put things right by collecting every single bit of loot and surviving to tell the tale. You see, it’s not only the vomit that Dougie needs to avoid, but pits of water, spikes and even the Overlord’s minions. Basically, if you can encounter it and it’s not a platform, a door, or loot, it can and will most likely kill you and when all of Dougie’s lives are gone, it’s game over. There are no continues, there are no tries, just death and having to start all over again from the very beginning, with every bit of loot returned to where you previously saw them and recovered them from. So, just to give you a real clear image of how devastating death is, let’s say you have collected 99.9% of the Overlord’s loot and just as you leap for the last bit of loot, you didn’t jump far enough as Dougie has a pretty limited jump and dies. With no other lives, the game is over and right then and there, you must decide if you will go for gold once more and try again, or walk away/play something else because you need a time out from Monkey Loot: Bling Palace. 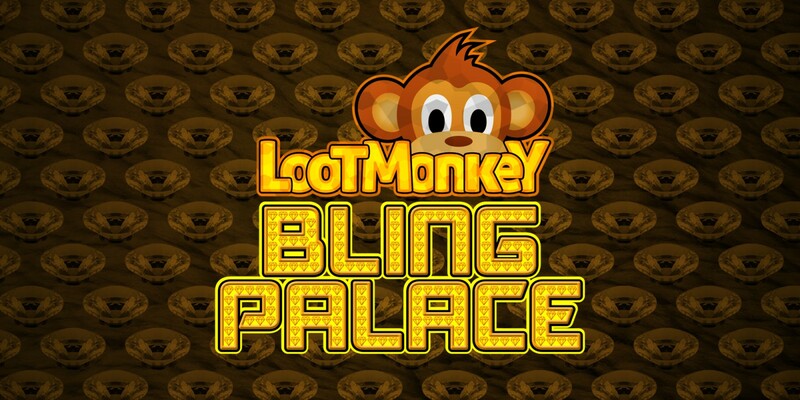 Because I feel like I am being a little mean to Loot Monkey: Bling Palace, I will go over a couple of positives, starting with the soundtrack. The cheesy 1980’s synth really does the game justice and so do the graphics. Whilst going for the old-school look, backgrounds to each room do feature a rather fetching photogenic background, the monkey sound effects aren’t the worst in the world and given the number of rooms you will have to wander through, the actual level design to each room is not too repetitive and actually shows some originality. The presentation of the game’s UI and text isn’t too obtrusive either. It’s definitely golden and a bit on your face, but it is creative, easy enough to comprehend and offers the means to limit just how much the Overlord will shout at you when playing. Its biggest function however is allowing players to decide on which mode they wish to play through, before going to New Game to get it underway. Of the 5 modes, one (Trial) is the practice mode I brought up earlier, with the first being the easiest (Speccy,) due to allowing players to start with 8 lives and can collect extra lives, which come in the form of Ankhs. Then there’s Willy, which only gives you 8 lives with no means of getting more. Willy is then followed by Manic, which gives you 1 life with the option of getting more, whereas the other mode is for the gamers with something to prove, as Amiel only gives players one singular life and no more. Suffice to say, if you play Manic or Amiel, all it takes is one death, to result in a gruesome game over, as the game over animation is a sequence of Dougie being crushed by his master’s barefoot. So, if you wish to be in his good books and prove yourself as a good monkey, you will absolutely have your work cut out for you in this mental, yet basic platformer. Being the “thinking man’s platformer” that Loot Monkey: Bling Palace is, even though the controls are simple and it is always pretty clear as to what you should do next, the fact of the matter is that Loot Monkey: Bling Palace might just prove a little too difficult and infuriating for those would consider giving it a go, especially when the game does can come across as feeling near impossible, even on the easiest gameplay mode. But if you’re not afraid of hardships and are in it for the long haul, willing to see Loot Monkey: through to the very end, the hours you can expect to put into it, will more than make up for the $7.00 US dollars you will need to spend to purchase Loot Monkey: Bling Palace in the first place. That’s great to here as a few of us who played it are hard-core platform lovers and just couldn’t get into it.